Also serving communities of Del Mar, Cardiff By The Sea. There are 40 Assisted Living Facilities in the Solana Beach area, with 2 in Solana Beach and 38 nearby. The average cost of assisted living in Solana Beach is $3,500 per month. This is higher than the national median of $3,346. Cheaper nearby regions include Poway with an average starting cost of $3,166. To help you with your search, browse the 130 reviews below for assisted living facilities in Solana Beach. On average, consumers rate assisted living in Solana Beach 4.0 out of 5 stars. Better rated regions include Encinitas with an average rating of 4.1 out of 5 stars. Caring.com has helped thousands of families find high-quality senior care. To speak with one of our Family Advisors about assisted living options and costs in Solana Beach, call (855) 863-8283. Solana Beach is a small oceanside town located approximately 30 miles north of San Diego, California. Seniors have plenty of options for recreation, from the Cedros Design District, which offers over 85 art galleries, shops, and cafes, to picturesque beaches with gentle surf and warm water. About 23 percent of the town's population of 13,400 are seniors aged 65 and over, and there are four different assisted living facilities in the area for those who need extra help with daily living tasks. The state of California regulates assisted living facilities through the Department of Social Services. The Senior Care Licensing Program licenses and monitors Residential Care Facilities for the Elderly and Continuing Care Retirement Communities. Solana Beach has a warm climate with breezes from the nearby Pacific Ocean that cool down the hottest days. July high temperatures average around 74 degrees Fahrenheit, January lows are about 45 degrees and annual rainfall is light. Seniors with health conditions alleviated by warmer weather may find relief here. On a scale of 1 to 100, with 1 being the safest, violent crime rates in Solana Beach are 19.9 compared to the U.S.average of 31.1. Property crime rates are 29.5 compared to the national average of 38.1. Seniors can get around with confidence but are still encouraged to use common sense and caution in regard to personal safety and with their belongings. The cost of living in Solana Beach is 289, compared to a U.S. base of 100. Healthcare and groceries come in at 85 and 103.7, respectively. Housing costs, however, are significantly higher at 704, which may impact the cost of assisted living for seniors. There are several options for public transportation in Solana Beach. The Coaster train provides light rail service between communities in San Diego County; seniors are eligible for discounted rates. Running within Solana Beach proper and in nearby communities is the Breeze bus line. Seniors, the disabled and Medicaid cardholders are eligible for discounted fares. Solana Beach has an array of community resources for seniors, including the Solana Beach Community Senior Center, an organization that offers socialization opportunities for seniors, including Bible study, lunches, group outings and game nights as well as eight senior centers in Santa Cruz County. The Solana Beach area is home to world-class medical facilities, including Scripps Coastal Medical Center in the event of medical emergencies or illness. Assisted Living costs in Solana Beach start around $3,500 per month on average, while the nationwide average cost of assisted living is $4,000 per month, according to the latest figures from Genworth’s Cost of Care Survey. It’s important to note that assisted living rates in Solana Beach and the surrounding suburbs can vary widely based on factors such as location, the level of care needed, apartment size and the types of amenities offered at each community. 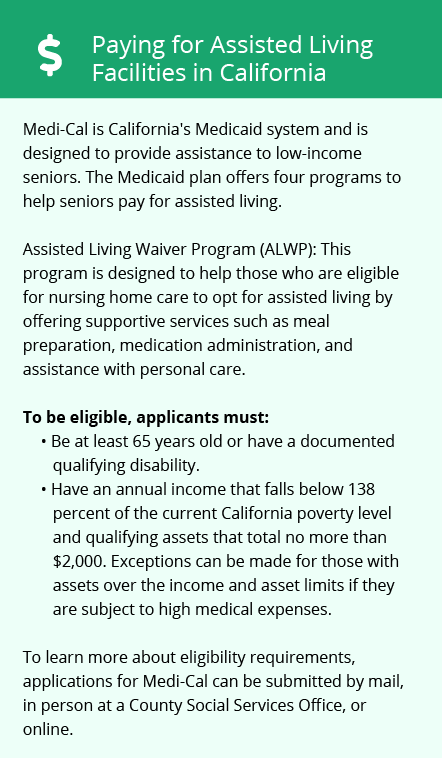 Senior citizens in Solana Beach, as in all of California, may be eligible for the Assisted Living Waiver. 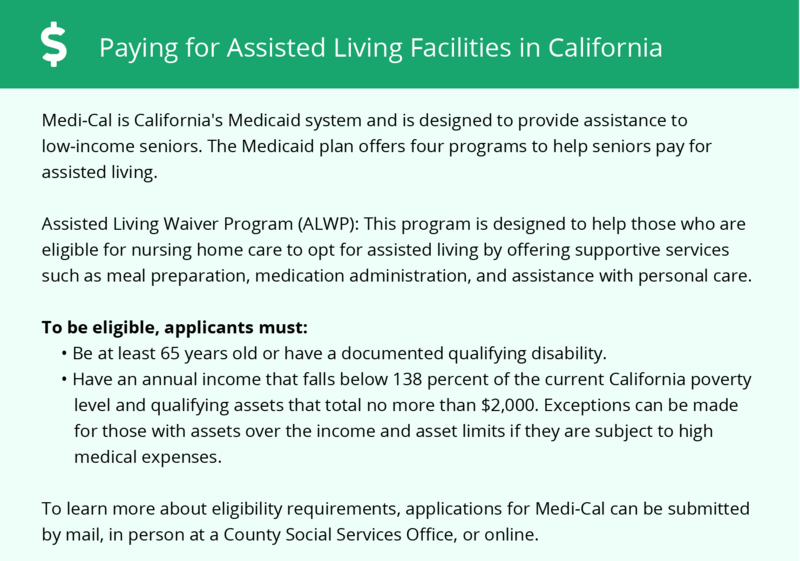 This is a Home and Community-Based Services waiver created by legislation that directed the California Department of Health Care Services to help accommodate those who need financial assistance with senior living. Many receiving Medicare or Medicaid benefits, or SSI income, may be eligible. Solana Beach and the surrounding area are home to numerous government agencies and non-profit organizations offering help for seniors searching for or currently residing in an assisted living community. These organizations can also provide assistance in a number of other eldercare services such as geriatric care management, elder law advice, estate planning, finding home care and health and wellness programs. To see a list of free assisted living resources in Solana Beach, please visit our Assisted Living in California page. Solana Beach-area assisted living communities must adhere to the comprehensive set of state laws and regulations that all assisted living communities in California are required to follow. Visit our Assisted Living in California page for more information about these laws.